The Wisconsin Historical Society has a long history of acquiring and preserving the records of the state. However, it was not until 1947, 101 years after the Society’s founding, that it was formally designated as the State Archives. Wisconsin’s first public records law, passed in 1907, authorized department heads to transfer any records older than 5 years to the Wisconsin Historical Society and specified that the Society would arrange and index the records. The law made no provisions for the destruction of records, extra space at Society building, or staff to carry out the new role. 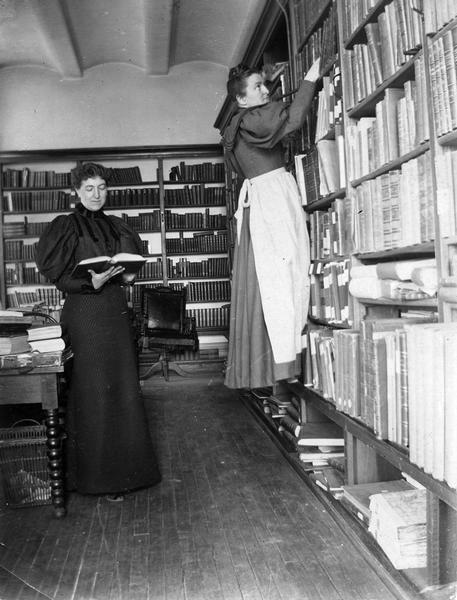 State records fell under the purview of the manuscript department and while several important record series were accepted space concerns curtailed the program, although public records were acquired until at least 1920. The Works Progress Administration’s Historical Records Survey once again brought prominence to Wisconsin’s public records. The Survey, sponsored by the WHS in Wisconsin, inventoried state, county, and local records. As a result, by 1936 state records began to be transferred to the WHS. The renewed collecting efforts were abandoned in 1943 due to lack of space. The approach of the Society’s 1946 centennial and the State of Wisconsin’s 1948 centennial appear to have sparked interest in developing a public records program for the state. Director Dr. Clifford Lord outlined an ambitious and expanded role for the Wisconsin Historical Society capitalizing on the upcoming state centennial. Among other initiatives, Lord called for a survey of the state archives as with the hope of developing a records program for the state. In October 1946 at the WHS’s centennial celebration, Governor Walter S. Goodland called for a state archives program at the WHS, he later organized two conferences of agency department heads which resulted in the Thomson Public Records Act of 1947 (Chapter 316 Laws of 1947). The Thompson Public Records Act established a three person Committee on Public Records comprised of the attorney general, state auditor, and the WHS director to authorizes the destruction of all state records certified by agencies to be no longer needed for administrative purposes. Additionally, the Act designated the WHS as the permanent archival depository for state records. In August 1947 the WHS hired its first State Archivist, Jesse E. Boell, to head the program. In 1949 the program was expanded in 1949 to include local government records and in 1951 to include court records older than 75 years. For a time, the University of Wisconsin Archives was a division of the state archives program, it was transferred to the University between 1954 and 1959. In the mid-1950s an effort was undertaken to give the WHS records management authority along with its role as the state archives. This effort proved to be more controversial than anticipated, and although it passed both houses of the 1955 legislature, it was vetoed by Governor Walter Kohler who wanted archives and records management to remain separate with records management housed in the executive branch. In 1955 the state archives joined with the Department of Research and the Bureau of Purchases to establish and operate a record center for inactive state records in the basement of the State Office Building (1 West Wilson St.). The three agencies ran a record center for several years. The Public Records Act of 1957 brought about major changes to the state archives program. Records management services were placed under the Bureau of Purchases, and that Bureau was assigned advisory responsibility for the Committee on Public Records. As a result, state archives staff was transferred from the Society to the Bureau of Purchases. The records of the state archives remained at the WHS, but without staff. The Bureau of Purchases and the Society developed an informal agreement that the state archives staff would be loaned back to the WHS to perform collections related work until the custody of the records was transferred. Rather than transfer the records, the state archives staff was transferred back to the Society April 1, 1960. The 1959 reorganization of state government lead to the creation of the Department of Administration. The new Department created a records management program effective August 1, 1959 and hired a records management supervisor to implement this program and the records act of 1957 on October 1, 1959. This new position replaced the State Archivist as the executive secretary on the Committee on Public Records in November of 1959, significantly reducing the WHS’s role on the Committee. In 1962 the Society reorganized, and the Division of Archives was combined with the Manuscripts Library, the McCormick Collection, and the Mass Communications History Center to form the Division of Archives and Manuscripts. State Historical Society of Wisconsin, A Century of Service, seeGoodland’s speech, particularly pages 4-5.